1. 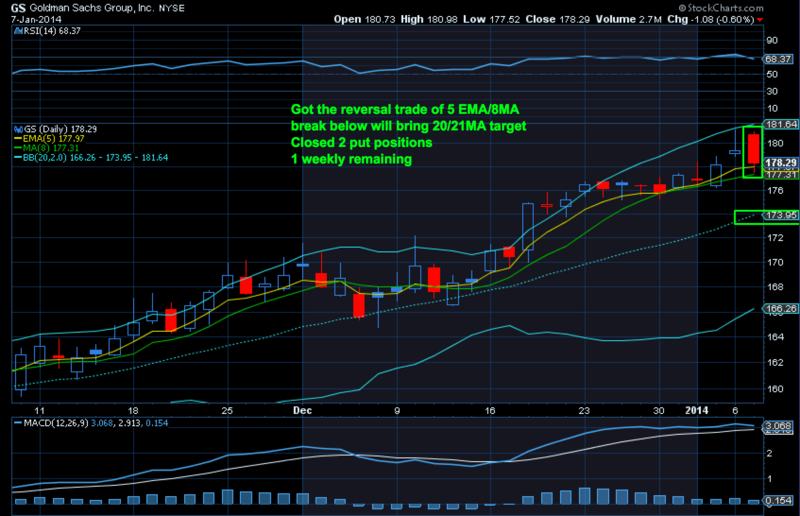 Several of you have suggested to me that I post open/closed positions on a regular basis. I think this is a good idea and I started doing some of this and as of today I will aim to post a running track record of open & closed positions every morning before open in the PT feed. Once a week I will also aim to update the P&L page on the website. I will obviously continue to post the actual trade entries and exits in the feed, but I want to keep admin work during trading hours to a minimum as I want to be focused on trading and not data entry. So posting a macro position summary once a day seems reasonable and doable. 2. Going with the last point on admin I also want to re-iterate the following I outlined when I started this service: I want to keep this service relatively small and manageable in order to keep my primary focus on you my clients & keep the service at the highest possible quality for trades & analysis. Frankly I didn’t expect so many clients the first month and so I’m grateful and thankful for the trust and response, but I’m also mindful what this means in terms of keeping focus and being able to respond to questions etc. For this reason I will be capping the size of this service at 100 seats maximum for now. So if you have any potential referrals you may want to make them aware. 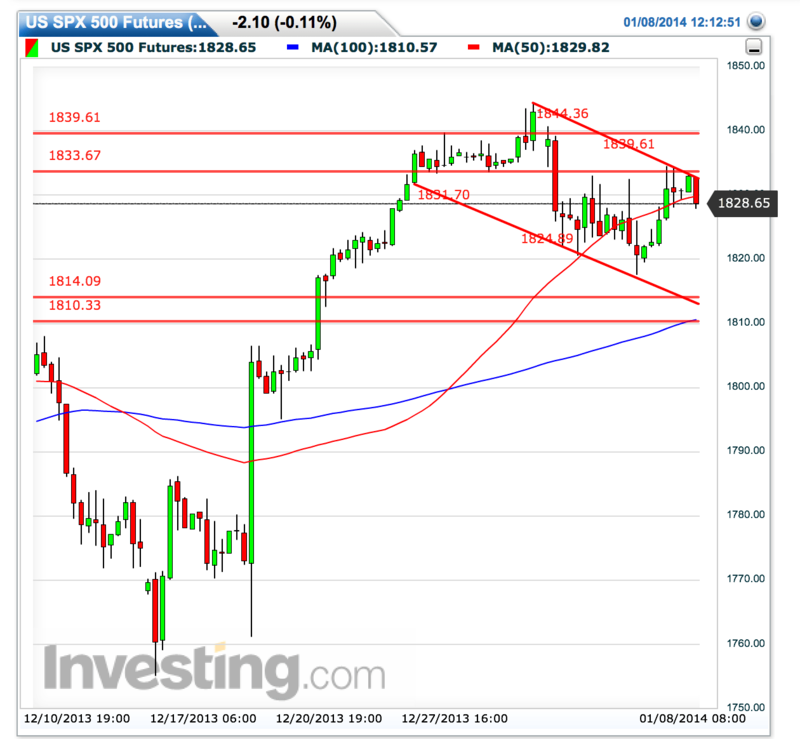 POMO did not disappoint and provided a relief bounce for the $ES after 3 days down. After all this market is only permitted to be down ever so briefly, at least that is the recent history. Yet 8MA resistance is holding for now. As I pointed out yesterday I do not think we have a solid low in place and this market is vulnerable to further downside. So I’m patiently re-building new short positions and taking profits on trades as they arise. 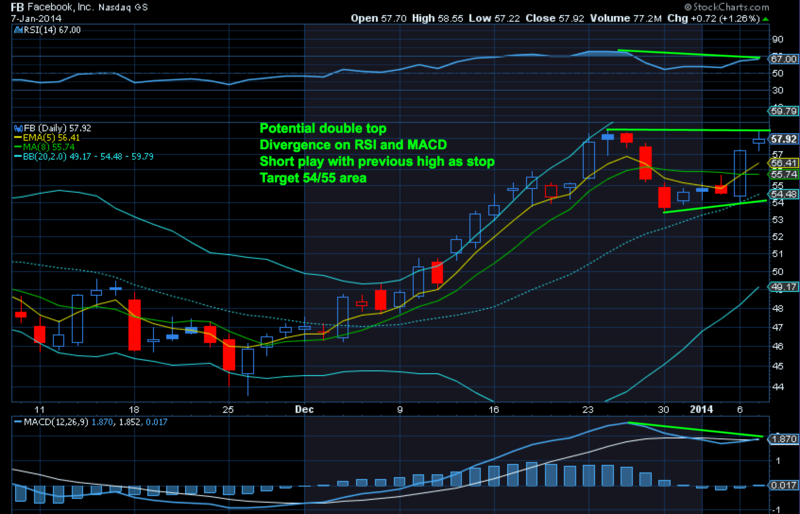 $GS provided such an opportunity yesterday. Overnight a wonderful Nikkei short opportunity presented itself for a 160 point gain ($800/contract) which I posted in the feed and I hope some of you had a chance to grab it. Today the focus will be on the release of the Fed minutes which may provide some clue what the Fed may do in regards to tapering. My take is that risk to the downside is there if the Fed outlines an aggressive tapering schedule. 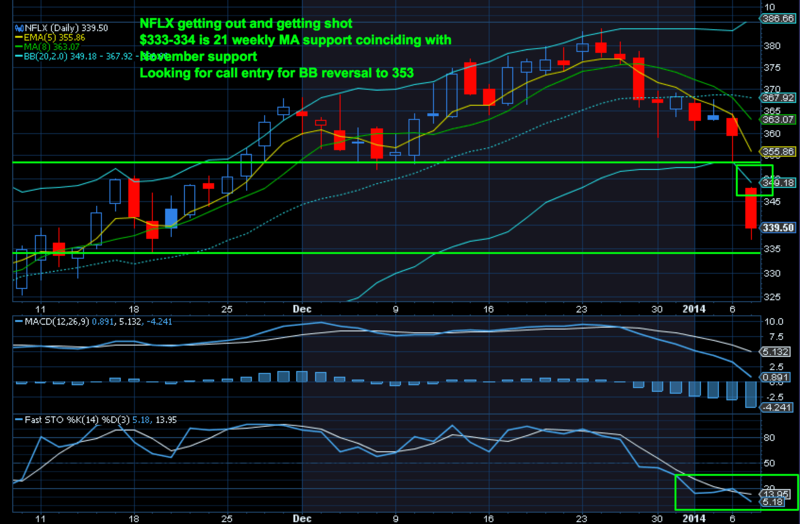 In lieu of this we may see the bounce continue into the 1834-40 $ES levels where I will add to shorts aggressively. 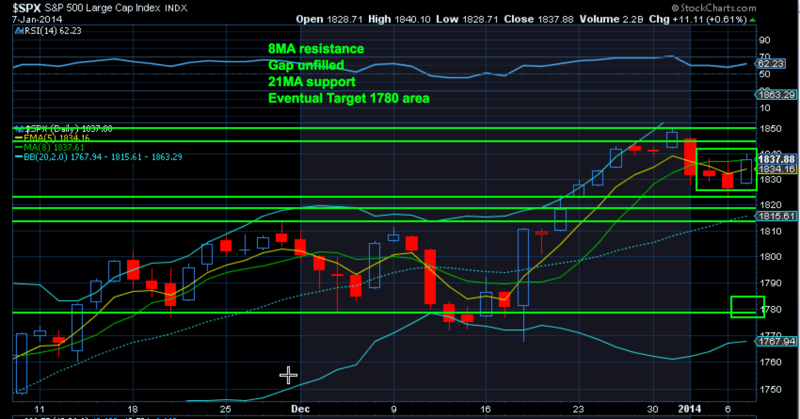 The 1810-1814 area remains my key buy zone for a bounce trade. I am very mindful of this channel that has formed on the $ES and $SPY that could be the build of a bull flag pointing to new highs. However for now the year 2000 fractal remains a guide as markets are currently following its structure very well. If the fractal continues I expect a range bound market for the next 10 days or so say broadly $ES (1810-1840) followed by a push lower into the monthly 5EMA in the 1780 area by end of month. 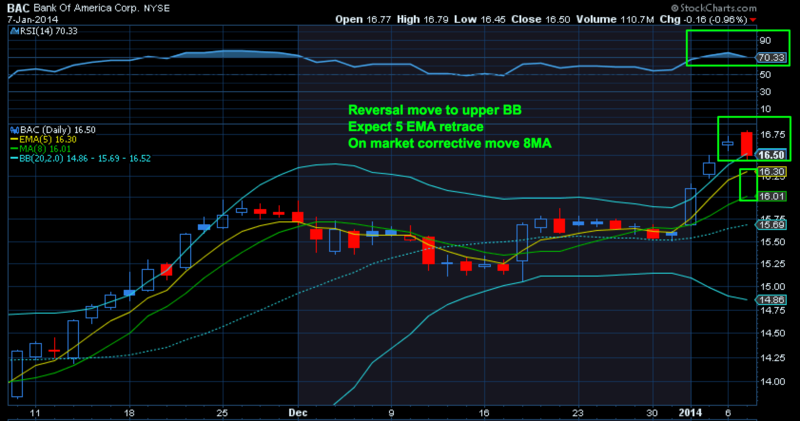 This is purely a guess on my part so I will keep trading the levels as I see them. But the fact remains: The current $SPX channel requires ever higher prices every single month in order to remain intact. If $SPX fails to take 1885 this month then we can note a change in character. This would not mean the highs are in (Dec 2013 may have been a left shoulder for all I know), but it would be a hint of a change that we can take note of. In the meantime I see potentially bearish action in recent leaders such as the #DAX. 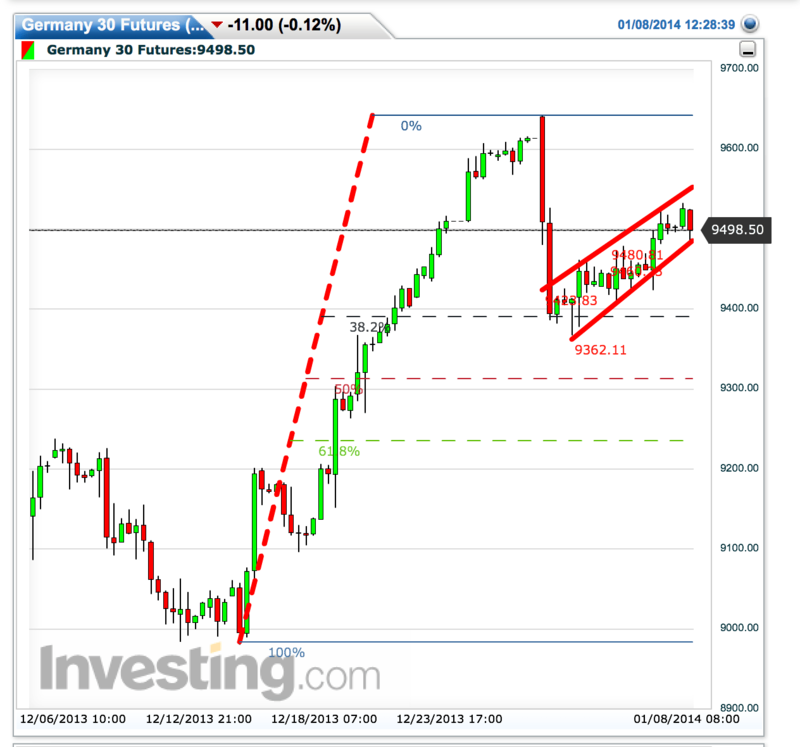 A bear flag has formed which points to the 9300 area and 50% Fib level as a next target if it breaks to the downside. As it stands markets are completely complacent again with a $VIX below 13 and a CPC ratio of below 0.5. And all that after one little bounce in the market. In any event, if I’m correct about the end of month direction then even my dreaded $GOOG puts may yet come back to provide some joy. great . thank you . 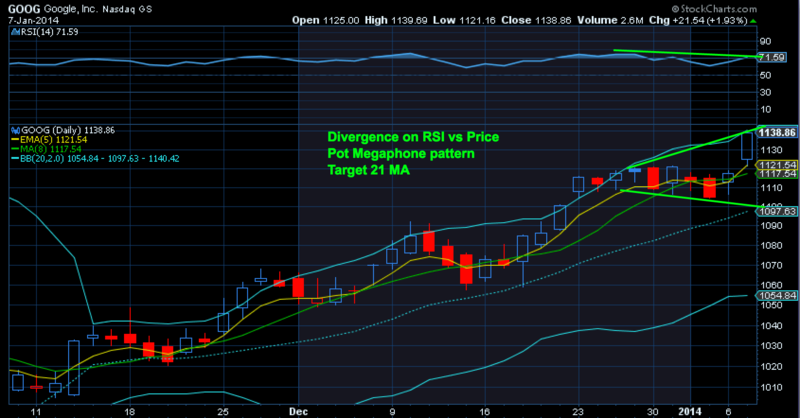 Can you start including apple on your charts ? thank you !